We bring you the next installment from James at Winter Patriot Community. 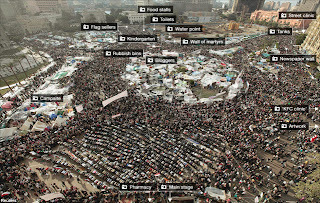 As the events in Egypt unfolded, we watched carefully to try to discern the forces in play. We thought we might be seeing something new. The only thing we might add to James' piece is that, from our perspective, the events in Egypt implode the accusations against Islam as a violent religion, and against the Arab world in general. At some point, lies become unsustainable. In the last article in this series on how Israel plans to rule the world, we ended up by reading the words of some of the protesters who were determined to keep control of their protest and their movement. This protest movement was at first seen as an extension of the protest movement in Tunisia which has been credited with the fall of the dictatorship of BenAli . But it soon began to follow a different course. The same pattern of American trained social activists (see here and here) were there as they were in Tunisia (and every other 'color revolution' in recent years) but two differences stood out as events progressed. Firstly, the protests were huge in comparison and all sectors of the Egyptian society were represented so that the American trained 'Young Turks' were swamped by the people and the local leaders that the protests threw up. Secondly, the protesters did something very different. They stood together in the face of brutal and sometimes murderous attacks from police both in and out of uniform, from thugs and criminals deliberately released from prisons and from trained snipers. They stood together against earlier separate attacks on Christians and Muslims designed to start them fighting each other. These bombings had the fingerprints of Israel and its murderous Mossad all over them. The protesters stood together, defended and cared for each other and tendered to the wounded. They chose not to retaliate and resolved instead to come back and demonstrate again the next day in spite of the beatings and killings and to keep on doing so. They 'turned the other cheek' and this is what made their protest powerful and released them from the grip of the forces who were not only behind the gullible American trained activists but also behind the likes of Omar Suleiman, head of the Egyptian Intelligence agencies, behind the police force, and, no doubt, behind the snipers, too. These dark forces can be traced back to Mossad and the CIA, then to their governments and ultimately to the bankers that control those same governments. They were going to crush these protesters but it relied on the protesters turning violent in response to all the provocation and so justifying their violent put down. But the protesters gloriously didn't rise to the bait and thereby defeated their opponents in this first and crucial round. Everybody watching on was so confused as to who was going to do what next that the significance of what happened escaped most people. Perhaps because, ironically but not surprisingly, the true nature of the teaching, “turning the other cheek”, is not taught in our so-called Christian culture, observers did not recognise the power displayed through the true exercising of it. “Turning the other cheek” has been falsely portrayed as a passive and even submissive practice or strategy but nothing could be further from the truth. An “eye for an eye” means countering violence with violence; as if this will resolve an issue. Why wouldn't the returned violence be returned again in turn? And so on ad infinitum? Yet this is the recipe preached by Judaism. How has it worked so far? It has worked extremely well for those with a vested interest in ever more violence but not for the rest of us. So let's look at the proposed alternative. It is curious is it not that Jesus would specify the right cheek? It must have had significance for him to mention it. Most people then, as now, are right-handed and unless you are trained in the gentle art of boxing it is usual to strike someone with your right hand. So to strike someone on their right cheek with your right hand, you need to give them a 'backhander'. This is the strike of choice for superiors when dealing with people they consider to be inferior to them and insubordinate to boot. So this is the situation Jesus was teaching on; how to deal with evil people in power. When you turn the other cheek they cannot repeat the backhander, they have to punch you if they want to continue. The trouble for them then is that they lose their superior position, their perceived legitimacy, in the eyes of the audience and are reduced to brawling like common thugs. Which is what they are; thugs in fine clothes. This perceived legitimacy is crucial because any despot knows that the people en masse have the power and not him. Hence all the pomp and pageantry and all the police and military might to impress this idea of superior status and power onto the general populace. Power over others is ultimately an exercise in deceit. Turning the other cheek is an act at once defiant and yet non-aggressive. It is in no way submissive. This action refuses to acknowledge the legitimacy or authority of the abusive power just as the people of Egypt have done. It does not accept the authority of the attack. It does not submit just like the Egyptians have not submitted. They have instead continued to demand that Mubarak's criminal behaviour cease and that he remove himself from his position of imposed privileged. They have pledged to stand there turning the other cheek until he does. Meanwhile, Mubarak was in the midst of his own tussle with the agents of the Americans and Israelis within his government and military. To combat his enemies, he desperately needed the protesters, the people, to cease their demonstrations against him, accept his promises and go home. But they refused. Mubarak's enemies within the gates, on the other hand, needed the protesters to turn violent to create what would look like a melting down of society and thereby give them the excuse to intervene using their own authority and attack the protesters for putting the 'security of the country' at risk and also to remove Mubarak from office at the same time for inciting the protesters with his intransigence in not resigning. (This is the reason the Israeli government was urging Mubarak to stay in office and lobbying other governments urging them to do the same i.e. to further exacerbate the situation). It would have been seen as a nice win-win for the generals just like in Tunisia except there were three differences. The first difference was that Tunisia doesn't have a Suez canal which is coveted by Israel. And likewise, nor does it have a Nile river whose water was promised to the Israelis by Sadat in the peace treaty we are hearing so much about again. And finally and most importantly, the protesters refused to play ball; they rejected violence, “an eye for an eye”. 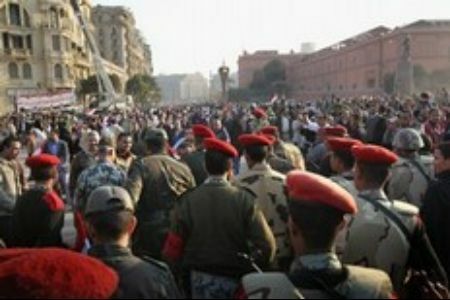 Had the protesters rioted in response to the outrageous provocations and the army marched in behind tanks with guns blazing, the rioting most probably would have spread throughout the country and Egypt would have become chaotic thus triggering the excuse for the anticipated invasion from Israel. Too late, the generals would see that they had been set up by their American and Israeli sponsors. But the overall plot and this plot within a plot were defeated because the protesters refused to “resist”. Resist in this biblical context means to stand against i.e. to “go toe to toe”, to battle with evil by returning violence. The protesters instead turned the other cheek and confused all their enemies; Mubarak, the generals and the world dominionists working through their captive governments of the US and Israel, their agencies from Mossad to Freedom House, their agents within the Egyptian hierarchy and their at least one time dupes in the sponsored activist organisations. 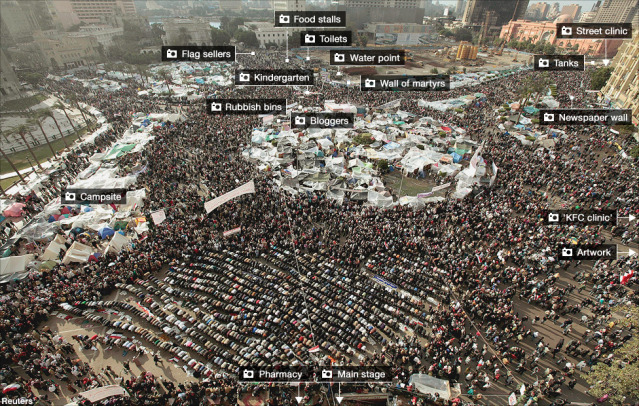 By not “resisting” in this manner, the protesters have saved Egypt an extraordinary amount of violence so far. Not only was it the way of peace for them but it became the way of peace for everybody. Such is its power. It is still only 'round one', for sure, but the army is on notice that the protesters will be out in the streets again if they don't enact serious changes to the constitution and the electoral process. And all gained without firing a shot. So what exactly transpired? How did this non-violent mass protest win “Round 1”? I've quoted Mao before saying “All political power comes out of the end of a gun”. And it is very true. Despite what may have been written in recent history, the only party in a country that can seize power from an incumbent political figure or party is that country's own military. They have the guns. (Costa Rica disbanded its army sixty years ago for this very reason). BUT if the soldiers holding those guns refuse to shoot then the power of the military leaders evaporates. So ultimately it is the foot soldiers who have the power in these situations. These are the enlisted men or, crucially in Egypt's case, conscripted men. Soldiers are trained to return violence. When they are called upon to act “pre-emptively”, they first must be convinced through propaganda that the 'enemy' is about to become violent towards them and their fellow countrymen. But what if the 'enemy' is not some bunch of rioters but rather their brothers and sisters, their mothers and fathers and it is very clear that they are not threatening violence but quite the opposite? Then human nature kicks in (psychopaths aside) and overrides the training and the propaganda and that is when the ordinary soldiers join the protesters. This is the very real situation the military generals faced. The generals and their sponsors were put between a rock and a very hard place by the protesters rejecting violence, an eye for an eye, and chose to “turn the other cheek” and stand there with their demands. If violence was the basis of human interactions between each other rather than co-operation, then there would be no need for all the fearful propaganda that we are constantly bombarded with in our society by our political 'masters'. The US and Israel should have seen the tell-tales that this 'color revolution' would not go as the others have but in their hubris they were blind. The tell-tales were there for everyone to see. 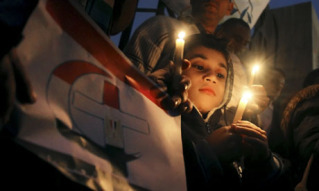 Back in December there were bomb attack against the Coptic Christians (link). These were undoubtedly perpetrated by Israel. The bombs were designed to cause splits between the two main religions in Egypt, the Muslims and the Coptic Christians. Mosques were attacked as well. This strategy of the Israelis has worked elsewhere but the response was different in this case. In an act of courage and love, the Muslim community committed to protect the Copts with their own bodies and declaring their commonality with the Copts; their commonality as Egyptians and as human beings. The significance of this cannot be overstated. This care and concern was reciprocated later in Tahrir Square where Christians surrounded muslims who were praying during the protests. Egyptians adopted a banner that displayed a Christian cross and a Muslim crescent together. The usual suspects should have taken heed. And we the spectators of this world event should have foreseen the very real possibility of the victory that lay ahead. But we didn't. We didn't because we have not been educated to know the true power of collectively turning the other cheek. We haven't been taught it because it threatens any entrenched power that presumes to exploit people and that includes religious power; especially religious power. Religious despots will teach that “turning the other cheek' is an act of humility; an act of submission, even martyrdom. What they are, in fact, teaching is humiliation. And this is exactly what the Egyptian protesters have complained about; 30 years of it from Mubarak and many more before him. But no more. Jesus, who is revered by both Muslims and Christians, taught and granted people dignity through his words and his example. He remained dignified and unbowed to authorities throughout his entire life. As I write this, I see that “Round 2” has started. The Egyptian protesters are out in the streets again and filling Tahrir Square demanding their fellow protesters who have been arrested be released and their torturers be brought to justice. 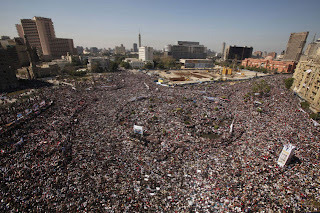 "Hundreds of thousands of Egyptians have poured into Cairo's Tahrir Square to celebrate the fall of president Hosni Mubarak and to pressure the new military rulers to deliver on reform pledges. Influential Muslim cleric Yusuf al-Qaradawi addressed the massive crowd during the prayer sermon, calling on Arab leaders to listen to their people. "The world has changed, the world has progressed, and the Arab world has changed within," said Mr Qaradawi, an Egyptian-born cleric based in Qatar. Fabulous! Everything's perfectly out of control (of TPTB). hey Bho! nice to see you. Libyan-Australian Mohammed told ABC Radio he spoke to his cousin, a doctor in one of Benghazi's main hospitals, last night. "He told me last night it's more than 280 people killed and more than 500 people injured and there is a shortage of the blood and all medical supplies in the hospital," he said. 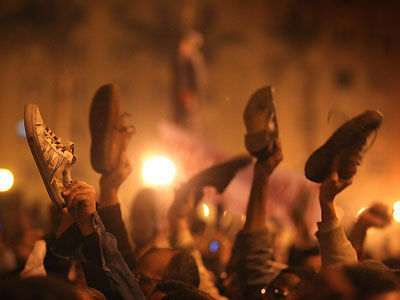 This morning there were reports Mr Gaddafi's support was crumbling as the violence escalated. Members of a Libyan army unit told Benghazi residents they had defected and "liberated" the city from forces supporting Mr Gaddafi, two residents said. Habib al-Obaidi, who heads the intensive care unit at the main Al-Jalae hospital, and lawyer Mohamed Al-Mana, said members of the "Thunderbolt" squad had arrived at the hospital with soldiers wounded in clashes with Mr Gaddafi's personal guard. "They are now saying that they have overpowered the Praetorian Guard and that they have joined the people's revolt," Mr Al-Mana said by telephone.